Hands down this is one the best music videos we’ve seen in quite some time. The concept is simple — it’s the 80s and a young kid is playing a Super Mario Bros./Ninja Turtles-esque 8-bit arcade game featuring the dudes from his favorite band, Lost in Society. The trio fights off hipsters, Juggalos, goth kids, The Kardashians, Arnold Schwarzenegger and even a giant half dinosaur/half Snooki. 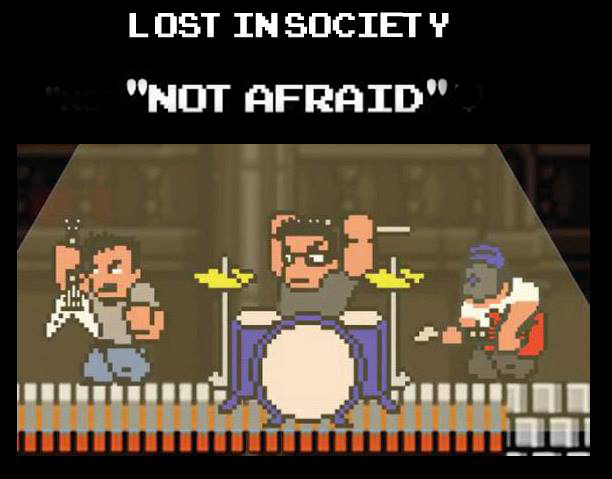 And believe it or not there’s a cameo by an 8-bit Dave Grohl as well.